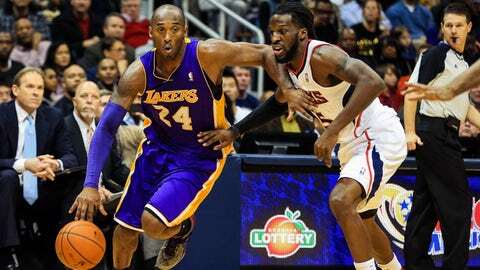 DeMarre Carroll (right) and the Hawks held Kobe Bryant to 4 of 14 shooting as the Lakers fell to 1-4 since his return. ATLANTA — Kobe Bryant stood along the baseline of the Philips Arena floor chatting with rapper 2 Chainz, while a few seats away were the Atlanta Falcons’ Steven Jackson, Tony Gonzalez and Roddy White. The Lakers, and most notably the Kobe Comeback Tour hit Atlanta, drawing a crowd that hit a higher octave when the 15-time All-Star was introduced. But Bryant — in his fifth game since returning from a torn left Achilles — faded along with his team down the stretch, as the Hawks pulled away for a 114-100 win Monday. "It felt a little stiff," Bryant said of his ankle. "The next level of progression is playing these games when you sit back out, get back in, is keeping it loose. … I’ve just got to keep my eye on the big picture." Atlanta went on a 23-4 run in the third quarter, which included Kyle Korver pushing his NBA-record streak of consecutive games with a three-pointer to 94, and was never threatened in moving back above .500 at 13-12. "In the third quarter, I thought our aggressiveness and our intensity on the defensive end set the tone for a good second half," Hawks coach Mike Budenholzer said. Bryant finished with eight points, six assists, three rebounds and five turnovers in 32 minutes, this coming off the best game of his return as Bryant had 21 points, eight points and seven rebounds against the Bobcats on Sunday. He committed four turnovers in the first six minutes of the game, all errant passes, one of which went four rows into the stands. He has 30 turnovers in all, a 6.0 average that so far eclipses the highest of his career at 4.1 in 2004-05. The Lakers (11-13) are now 1-4 since Bryant rejoined the lineup on Dec. 8, and that comes after they had won six of eight before his return. The on-ball defense that earned him 12 All-Defensive Team selections, including nine first-team nods, isn’t there yet. Bryant, at this point in his recovery, seems most tedious here. He spent most of his time playing away from the ball, though he did notch his first steal immediately after a he turned the ball over on the game’s opening possession. "Mentally, it doesn’t bother me much," he said of the injury. "Physically, the foot and ankle were immobile for a very long time. It takes a while for it to react to the movement, to the pounding." There were glimpses of the Bryant of old, like in the first-quarter when he pushed past DeMarre Carroll for a driving off-hand layup. Then in the third he spun into the late, pulling up for a jumper only to come up empty. "There’s certain things where I feel like I can do and other things I can’t do yet, but I feel like they’re coming," he said. "It’s just having the patience and keeping your eye on the big picture." It’s not just that Bryant is trying to work out the kinks while everyone else is in regular-season form, he’s also doing that playing out of position. With Steve Nash, Steve Blake and Jordan Farmar all injured, Mike D’Antoni has moved Kobe to point guard and in making his third straight start at the position, the results have been shaky at best. "It’s new, because I’ve got to figure out who likes doing what in what time of the game," Bryant said. "It takes a little adjusting, but it will get there." Pau Gasol, who had 16 points and 10 rebounds, offered his assessment of Bryant’s progress, saying, "So far it’s been successful. So far he hasn’t gotten re-hurt … so that’s a positive." But Bryant found himself worn down as he was hounded by DeMarre Carroll, shooting 4 of 14, with six of his points coming in a two-minute, 30-second span in the first quarter. He didn’t hit another shot until more than halfway through the fourth. "That’s why I wanted to pick him up full-court, to get his legs tired," Carroll said. "His shots were falling short because his legs were tired." Carroll had 13 points as all five Hawks starters scored in double figures — Al Horford had 19 points and six rebounds, Paul Millsap had 18 points and nine rebounds, Jeff Teague had 17 points and 10 assists and Korver had 11 points — and Mike Scott added 14 points off the bench. "Great intensity," Budenholzer said. "Great aggressiveness and I think we played off of our defense. We moved the ball well. We found the open guy. That’s how we want to play."